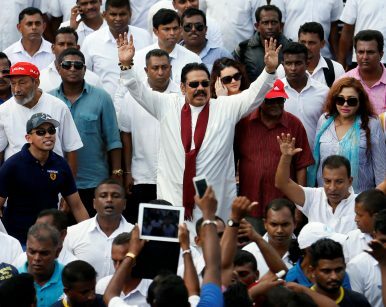 Sri Lanka's former President Mahinda Rajapaksa (C) waves at his supporters at the end of the five-day protest march against the incumbent government in Sri Lanka (August 1, 2016). As recently as a year ago, social media was obsessed with the misdeeds of the Rajapaksas. Since then the focus has changed. It is no longer about the Rajapaksas. Instead, discussion are full of the shortcomings of “Yahapalanaya” and its leaders, and their inability to deliver the “good governance” (a loose translation of yahapalanaya) they had promised. The themes which dominate the Sinhala media and social media are particularly revealing of popular perception. This narrative sees an administration conducting witch hunts, exhuming dead bodies, locking up and then releasing Rajapaksas, reprimanding Buddhist monks for keeping elephants, attacking disabled soldiers while releasing convicted terrorists, welcoming former terrorist organizations, and praising former terrorist leaders. The sight of distinguished soldiers and service commanders, men esteemed throughout the country as war heroes, being regularly dragged into court and sometimes kept in cells has become a familiar spectacle. Recently both the former Navy commander and the former army commander found themselves confronted with allegations of fraud, corruption, and abuse of power. In the public mind this seems to have become a feature of “Yahapalanaya,” a feature so politically damaging that Sirisena found himself forced to repudiate the actions taken by the Bribery and Corruption Commission. One of the rallying cries of the new government was reconciliation. This now threatens to boomerang back into its face. Despite the overtures which have been made, all the signs suggest that neither the Tamil diaspora nor influential parts of the Tamil community in the north have renounced the language of separatism. Toward the end of November 2016 hundreds gathered to celebrate the birth anniversary of slain terrorist leader Velupillai Prabhakaran, founder of the Liberation Tigers of Tamil Eelam (the LTTE). This was despite the government’s warning that action would be taken against anyone trying to take part in the event. The month before, there had been a series of sword attacks by former LTTE cadres on policemen and security officials. This was said to be in retaliation for a shooting incident where two Tamil youths were killed by police. Earlier still, in July, ten students had to be hospitalized and the Jaffna University closed after violence broke out during induction ceremonies. The incident was said to be sparked by the use of Sinhala cultural rituals during the ceremony. Taken together, these events have fueled public perceptions among the Sinhala majority that separatism is alive and well and that the Sirisena administration is acquiescent, if not compliant. Reconciliation ultimately means that the bringing together of opposing factions or communities, to ensure lasting stability and harmony. Yet there is little evidence that the gap between the Sinhala majority and the Tamil minority in the north is being bridged; if anything, it appears that the rift is widening. In the current discourse, animal welfare has also become an emotive political issue. Under the new government, numerous campaigns have sprung up against the use of elephants in peraheras (Buddhist religious processions).The elephant has been part of Buddhist culture and tradition for millennia and these campaigns have stirred up strong feelings. Pressure from activists has also led to Buddhist monks being reprimanded for allegedly ill-treating elephants. While English social media highlights the rescue of elephants from malnourishment and ill treatment, Sinhala social media perceives an onslaught against time-honored traditions by foreigners and non-Buddhists. The result is to stoke widespread murmurings and deep suspicion, once again intensifying the fissures in Sri Lankan society. The new constitution proposed by the UNP has tended to intensify these fears and misgivings. Although lauded by civil society figures, Western governments, and foreign commentators, it has only heightened the abiding suspicion among Sinhala that the government intends to do away with the central place which Buddhism has occupied in Sri Lanka’s society for over 2,000 years. On the third day of the new year, the Reconciliation Task Force appointed by Prime Minister Wickremesinghe presented its final report to former President Chandrika Bandaranaike Kumaratunga in the presence of External Affairs Minister Mangala Samaraweera. The Task Force was set up in 2016 to inquire into the events of the civil war and to seek accountability, truth, reparations for the victims. From the very beginning, the nature and composition of this Task Force came in for intense domestic criticism. Dominated by foreign-funded NGO and minority activists, the Task Force has been condemned for being one-sided and deeply unrepresentative. It is significant that both the prime minister and president chose to absent themselves from the final ceremony, because its conclusions could be a ticking time bomb. The Report calls for Special Courts and a Special Prosecutor’s office, with foreign participation as judges and prosecutors. Sri Lanka’s army has never been seen as a voting bloc. As a result its political potential has never been fully analyzed. Although now trimmed to some 160,000 personnel, in 2010, shortly after the end of the war, the Sri Lanka armed forces had 200,000 men on active duty, between 20,000-40,000 reservists, and 18,000 national guardsmen, comprising nearly 250,000 in total. Combined with extended families, social and kinship groups, this could amount to as many as a million voters drawn from every part of the country. Overwhelmingly Sinhala and overwhelmingly Buddhist, it represents a silent block of highly trained, educated, and politically conscious voters, with ties and connections into every walk of society. The idea that this section of society could now be held accountable by foreign judges and prosecutors is inflammatory and potentially explosive. For Sirisena and Wickremesinghe, it is an electoral disaster waiting to happen. Politically, all these actions could be deeply counter-productive. They will not win votes; they only will lose them. For good or for ill, the UNP as the principal driver in the government will receive the greatest share of the blame. In striving to please its international backers and satisfy its urban and minority constituencies, the UNP could alienate a large part of its traditional support base. Despite wholehearted support from minorities, the support of a substantial segment of the majority was a critical factor in the downfall of Mahinda Rajapaksa and the rise of the “Yahapalanaya” government. In the 2015 presidential election, statistics show that 40.96 percent of the Sinhalese community voted for Sirisena and the UNP bloc. This percentage proved crucial, giving the floating voter a vital say in electorates across the country. The last two elections saw large chunks of Rajapaksa’s constituency drift away; some did not even vote. There is the danger of the same thing happening to the UNP. The signs suggest that the floating voter has now well and truly crossed back and is biding his time. Overhanging all of this is the spectacular and massive corruption of the Central Bank Bond scandal, which has dogged every step the government has taken. Rumored to have cost the country between 35-45 billion rupees ($233-$300 million), the greatest loss of all has been trust and confidence. In one fell swoop, the scandal has undermined the government’s stand on corruption and transparency, depriving it of one of its principal weapons against the Rajapaksas. The fact that this has cost the country as much as any of the “ financial crimes” perpetuated by the previous regime has been well and truly driven home. Just as damaging, the man held responsible, former Central Bank Governor Arjuna Mahendran, was handpicked by the prime minister, who then defended by him until the very end. Although Sirisena is now frequently attacked for appearing weak and ineffective, it is widely accepted that he is a “son of the soil,” relatable to the average voter. Wickremesinghe, in contrast, born, bred, and educated in Colombo, has never shaken off the perception that somehow he doesn’t quite connect with ordinary Sri Lankans. This has left him vulnerable to recurrent accusations that he is the pawn of foreign interests, a man who does not have the national interest at heart. This perception has not been helped by his plans for an “economic union” with India, especially south India. In October 2016 Mineka Wickramasingha, former Chairman of Ceylon Biscuits Limited, warned of the dangers of the Economic and Technology Cooperation Agreement (ETCA) with India. One of the first Sri Lankan companies to set up a manufacturing business in India, Ceylon Biscuits was forced to close down its operations in India due to the hidden taxes, tariff barriers and administrative opposition that it encountered. A pioneering entrepreneur and a highly respected figure in Sri Lankan business circles, Wickramasingha’s comments reflect a deep-seated unease. Pillars of the business community are now quite open in their dissatisfaction with the current government. They point to several factors, the lack of direction and consistency, coupled with a crippling failure to deliver, compounded by an even more crippling perception of being ineffective. In the last three years of the Rajapaksa regime, economic growth was high, ranging from 7- 8.5 percent. Since then the momentum has been mostly downward, and the best that Sri Lanka can hope for in 2017 would be about 4.5 percent. The country is struggling to cope with the massive debt incurred by the previous regime and there is mounting pressure for the rupee to depreciate against the dollar. Without sufficient foreign exchange reserves, Sri Lanka may not be able to avoid a massive depreciation of the rupee and the runaway inflation that could go with it. Coupled with all the other factors at play, it will only fuel the deepening discontent. The underlying currents are very clear: the Sirisena-Wickremesinghe administration has been unable to drive its advantage home. With the stream of accusations, interrogations, inquiries and arrests, it has only succeeded in generating sympathy, resurrecting a damaged and discredited dynasty. Despite all the dents of the last two years, Mahinda Rajapaksa’s charisma and political appeal continues to endure. However, under the constitution, he cannot return as president. Plus, his legacy has also been tarnished by failure. The silent figure in the equation is the former president’s brother, Gotabaya Rajapaksa. His Facebook page, entitled New Hopes Rising, looks to the future and hints at a new dawn. A powerful political force, in the public mind Gotabaya Rajapaksa represents achievement and doing, a man “who will do what he says he is going to do,” to paraphrase de Silva once again. In the Sri Lankan heartland, people are waiting for a change. Towards the end of 2014, the Rajapaksas were the past. Now they could be the future. A historian and academic, Dr. SinhaRaja Tammita-Delgoda is an authority on the art and culture of Sri Lanka. One of the few non-combatants to have been allowed in the war zone during the final stages of the Eelam War, his work has been featured in the national and international press and in military journals. He has lectured in the U.K., United States, Canada and India.